Alright, take a moment. Think about your living room for a moment. You probably have a few pieces of comfy furniture. Perhaps there's a bookshelf in the corner or a TV on the wall. Maybe you've even found a few perfect decorations to adorn the mantel. Isn't it all a little too... homey? Where's the death and destruction? Where's the terror? After all, if you want to have one scary party, then you're going to need to spookify your living! You need some skulls. 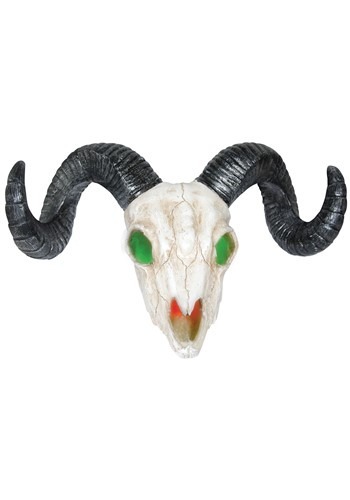 This Light Up Ram Skull Prop is the perfect way to add some creepy character to your home! The skull is molded to look like a ram's skull and even has weathered cracks all over the surface. The skull lights up and requires 3 button batteries to operate. Some assembly is required to set-up your ram skull, but once you have it all ready to go, it's sure to add a spooky spirit to your living room. If you're putting on a scary costume party this year, then you're going to want this Ram Skull Prop to round out your decor. It's delightfully creepy and officially prepares your home for frightening festivities.